This 3-day tour of St. Petersburg is perfect for cruise ship guests making a stop in the city because it’s visa-free and includes all transportation. 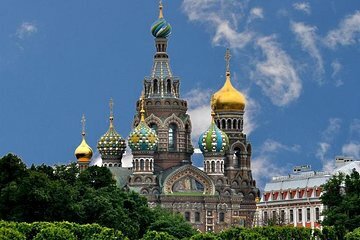 See popular places, such as the Russian-Orthodox Peter and Paul Cathedral, Catherine Palace, and St. Isaac’s Cathedral. Gain early entry into The Hermitage and the Peterhof Gardens. Visit the Faberge Museum, and then head to Yusupov Palace to walk through the Rasputin exhibit. Plus, see the city sights by boat on a cruise along a river and canal. Excellent tour. The best part was the guide Angie and the driver De metri. Both took very good care of us. Our Tour - Ala Tours - was an excellent experience. Our tour guide Angie Melicova was so nice, well informed and very pleasing and accomodating to all in the group! When visiting Russia for the first time we needed a reliable company. This Tour covered all the palaces, the hermitage, subway, river tour, lunches, shopping and english speaking tour guide. The only thing I would change would be the lunches. Seems most of the tours have similar stops. Feel confident if you are on a cruise. They will pick you up and get you back on time. Small group of no more than 16 in a very comfortable mini-bus our was mbz. The cruise trip had 40 to a bus ... we occasionally got to the same stop as the cruise bus and we usually had more time at each stop and had some flexibility. Feel confident when booking this tour. Best tour ever! Fabulous guide. Got into Hermitage when it was empty and skipped all the lines. Saw everything. Highly recommend. If it is not already on there, put St Petersburg on your bucket list. If possible read something about the Romanov dynasty before you go. We had 3 quite remarkable days visiting the principal sites in and around this remarkable city. The history of this city goes back to Peter The Great who built the city on a swamp. Nowadays it is testimony to other great Tsars, particularly Catherine the Great who established the Hermitage museum and built a quite remarkable collection of fine art. The opulence of the palaces and gardens is amazing. For me, the best by far was the Peterhof, which is about 50km north of the city. Their gardens span over 200 acres, complete with fountains and other smaller palaces. This tour was absolutely exceptional. Our guide, Svetlana Lana, was beyond outstanding. Her knowledge went way beyond what anyone had a right to expect. She somehow got us through queues while others waited, and knew where to go first to avoid the long lines that later developed. Her command of English was fabulous it helps that she also teaches English, I suppose!. I'd give this tour 6 stars if it were possible. One other thing -- compared to the prices charged by our cruise line, we saw twice as much for half the cost. This 3-day tour was the highlight of our entire cruise. If there's any way you can get Lana for a guide, do it. St Petersburg is astonishing and this tour shows the very best of it. Our guide Ekaterina was knowledgeable, friendly, interesting and interested in making sure we got the most out of our time in the city. The ticketing arrangements were good and easy. No need to pay over the top for a cruise tour. Our St. Petersburg tour was more than we could ever imagine. Our guide Svetlana of Alla tours was the most knowledgeable guide that we have ever experienced.